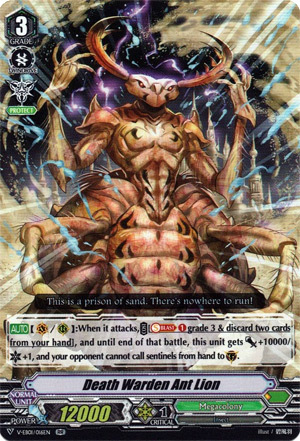 [AUTO](VC/RC):When it attacks, COST [Soul Blast (1) grade 3 & discard two cards from your hand], and until end of that battle, this unit gets [Power]+10000/[Critical]+1, and your opponent cannot call sentinels from hand to (GC). So between this and Phantom Black, what you’re looking at is a nigh unblockable attack…if you can spare the -3 from hand that useable on VG and RG circle. As far as getting a G3 in soul goes, Spark Hercules can absorb a Stag Beetle you have on RG circle, as long as you have Small Captain Butterfly Officer set on the board, otherwise you’re going to have to ride again. So it’s hella expensive. The main saving grace for its stupid cost is that the Standard Megacolony Deck needs to run a decently high amount of Grade 3s to proc Mantis and Hornet consistently, so you can max the main G3s and tech this at like 2 copies. Hopefully just Spark Hercules can do a decent job of it, but at least an optional finisher like this one exists.